St. Brigid proved a bit challenging to make as a FLAK and has been put on hold for now. Not like I don't have anything else on the needles! Henry VIII is underway but I'm having second thoughts. Knit friend Shirley suggested taking the project out into the sunshine as it looks so dull inside the house. The Virtual Yarns colors are a lot brighter in the sun and really show their depth but something’s just not working. I’ve got to confess to not being absolutely in love with Henry to this point. I keep thinking of Ravelry member Kibben’s Henry VIII cardigan and that I’d wear it much more than a pullover. Also know that I’ve got to slightly inset the sleeves as I did with Lismore. Those dropped shoulders and my shape don’t work well. I might just put it aside for a few days and think on it. It’s always painful to rip out what’s done but a lot less painful than finishing the sweater and not wearing it. Wore them today and they are very comfortable and easy to wear. I did pick up Kathleen Taylor's "Big Book of Socks" at Border's today. I love getting those 30% off coupons. Joe's "Kangaroo Pockets" sweater is up to the shawl collar start on the front (back is finished). I'll work on it again after I decide what to do with Henry. I haven't bought yarn for Henry VIII but I probably will eventually. I really like the VY colors but I know that their yarn is definitely heavier than Shetalnd so I've been leery about making a pullover. 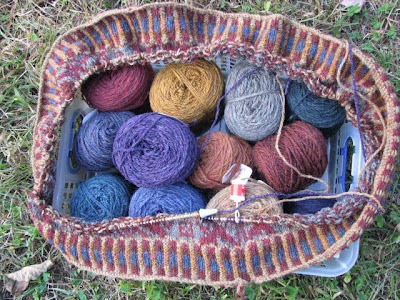 If I make Henry in VY Hebridean I will probably make a cardigan as I like the look of Kibben's. Are you not using the VY pattern? I didn't think their pattern had corrugated ribbing. And if my Marina was any indication I'd expect the VY Henry to have slightly inset sleeves as well. Your Henry VIII looks great...but I know what you are saying.... what a lot of work if you end up not wearing it. I love the socks! They look very comfy. I keep going back to kibben's cardigan version too. Henry's on hold for me too until I make up my mind and clear some UFOs from the basket. Your socks look warm and comfy and just in time! I love your Lismore. It is softer and much more beautiful than mine. Do you know that mine has never been worn? Mine would look great on a smaller person with a different hair color and complexion. I was 40 pounds lighter in those days so it doesn't fit. BTW, your friend might be right. You might wear Henry 8 a lot more as a cardigan. I rarely wear Hank but I loved knitting it. It kept my interest. 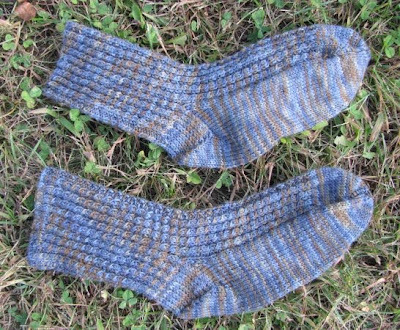 Mine was done in the old AS Campion yarn. The pattern shows up well and to me, it was like knitting a tapestry. Rarely gets cold enough here to wear it. Did you like the Autumn cardigan in VY? I know the VY colors were muted. Do you ever wear it? Frankly Anne, you are the best fastest knitter I have ever known. Go with your instincts on Hank. Great stuff on the blog. Makes me want to finish Cape Cod. I am stuck on the neck gussets. Can you help? Sorry to hear you won't be knitting Henry, but I understand. It's way too much work if you don't just love it! Still... I'll be missing your comments and input.